Obnoxious RINO Lindsey Graham is up for re-election in 2014 and sadly, no blue chip candidates appear to be stepping up to the plate to take him on in a primary. That being said, if a grassroots candidate gets in the race who can catch fire nationally, Graham is still beatable. Richard Cash is already in the race and state senator Lee Bright is also considering a run. However, the candidate who seems to have the best chance to catch on across the country would seem to be Nancy Mace, the first woman to graduate from the Citadel. She’s conservative, has charisma and she’s seriously considering taking a run at Graham. 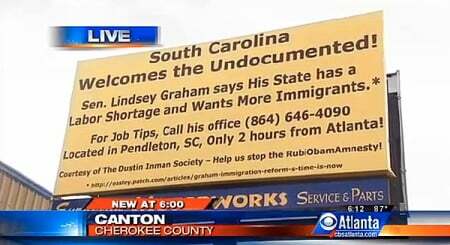 If she does, expect conservatives who’ve had enough of Graham to keep running ads like this one. A brand-new Georgia billboard proclaiming South Carolina’s alleged affinity for illegal aliens is raising eyebrows this week. Sen. Graham, R-S.C., sits on a bipartisan committee that just passed a sweeping immigration-reform bill. King blasted the immigration bill, claiming illegal aliens will have an easier time getting jobs in the U.S., while making it more difficult for American citizens to find or hold onto employment. “I think unemployed Georgians are already kicking and screaming,” King told WGCL-TV, the CBS affiliate in Atlanta. Beating Graham would be an uphill battle, but it’s possible and definitely worth doing. South Carolina is conservative enough that the winner of the primary is practically guaranteed to win and knocking off Graham would do more to stiffen the spines of Republicans in the Senate than just about anything else we could do. Want to make the Senate more conservative? Beat Lindsey Graham. Want to fight amnesty? Beat Lindsey Graham. Want to send a message to the Republican Party? Beat Lindsey Graham.